Happy Energy Want the Best Central Heating System for your home? Whether you want to upgrade an old boiler, install a new one or just need an existing boiler servicing, our central heating services provide everything you need to keep your home warm. What types of central heating are available? Most homes have wet systems. These circulate hot water through a system of pipes that connect to the radiators in your home. 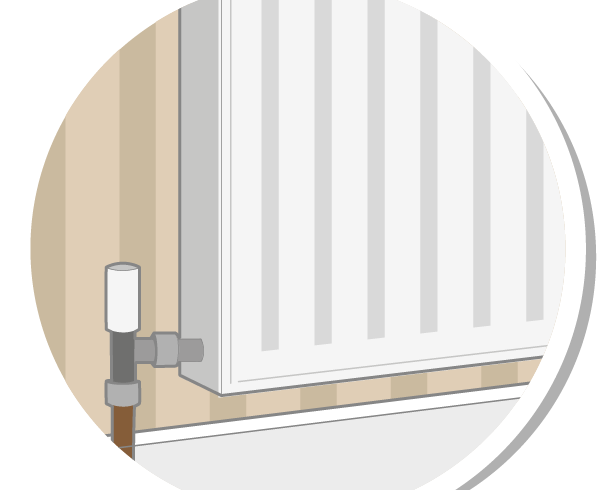 A boiler heats the water that feeds the network of pipes. Storage heaters store heat at night and release it during the day. To use them most efficiently you need to be on an Economy 7 tariff with your electricity provider. Storage heaters contain bricks that absorb heat and release it slowly over a period of time. Electric underfloor heating uses power to warm cables installed under the floor. In some respects these systems are easier to install and maintain than underfloor heating using a wet system as there is no need for pumps and no worries about leaks. Warm air systems work by heating air with a boiler before pumping it through a series of vents usually located in the floor or walls of the room. Not much used in the UK anymore. This will allow you more control over your heating spend. Boilers with a digital timer and radiators with thermostats allow you to turn the individual radiators up and down. More advanced controls can zone your heating into different circuits and can be controlled with an app. We offer boiler servicing and recommend it once a year to keep your boiler operating efficiently. Our Gas Safe, Oftec and HETAS qualified engineers can service your boiler and replace any parts that need changing. How to choose the right heating system for you? Talk to us – we will help you to decide what is right for your home. Call us on 0800 0 246 234. Book a visit from one of our experts so that we can provide you with an assessment of your central heating needs. If you require work to be done we will provide you with a quote. Why choose Happy Energy for your Central Heating? Free no obligation Happy Energy energy advice for your home. Grants available to customers in certain areas – call us for details. Installation, support and advice through the entire process. Fully trained and accredited installers – Hetas, Stroma, OFTEC, Gas Safe.